. 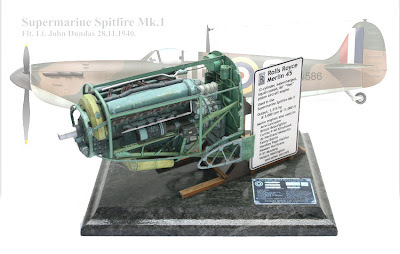 Alin Osarik's 1/33 scale Merlin 45 Supermarine Spitfire engine is a free downloadable paper model kit, available here. 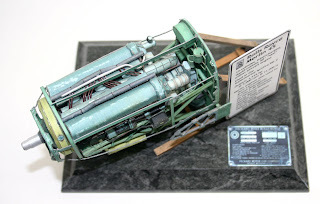 I built Alin's Merlin engine in 1/16.5 scale (by printing the parts sheets at 200%). I think I have about 80 hours in it, maybe more. It's certainly not a beginner's project; I had to do some improvising along the way. I found a few minor fit problems but overall it's an outstanding kit. I used plastic rod for the engine mount, and copper wire, aluminum rod, and aluminum tube for the hoses, lines, and piping. The engine stand is basswood. The builder's plate came from Alin's site. The whole thing sits on a 5x7-inch base. The Spitfire profile in the background is by Croatian artist Vjekoslav Ranec, used with his permission. Here is the firewall/engine mount assembly before the prime mover was installed. The main engine mount tubes are plastic rod, the stand is basswood, and the lines are copper wire. Everything else is paper. I'm still in awe of anyone who could build this kit in 1/33 scale! Thank you, Alin, for a wonderful kit! 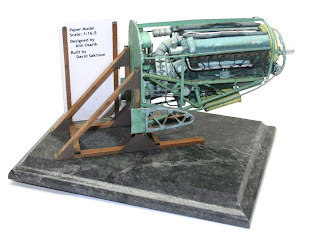 I want to tackle your Daimler-Benz 601 engine (in 1/16th scale) one of these days, but not too soon. 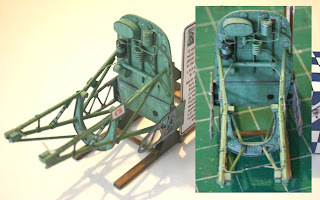 And I'm still thinking about enlarging the 1/33-scale Halinski Spitfire cockpit to sit behind the Merlin. Several modelers have asked about the builder's plate I put on the model's base. I thought it came from Alin's Web site but I can't find it there, so I'm posting it here. The plate is actually for a later variant of the engine, V1650-9 built in the USA by the Packard Motor Car Company. 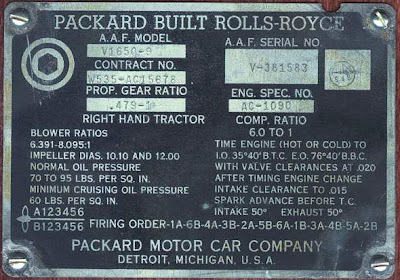 Packard began building Merlin engines in 1940, under license from Rolls Royce. Most of the Packard-built engines went into P-40s and P-51s. 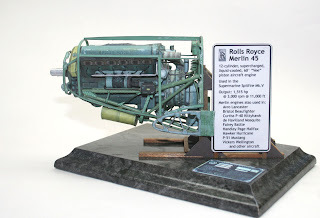 But it's the only Merlin builder's plate I could find and it's mostly illegible on the model. Anyone who wants to quibble about it can write to the Packard Motor Company. So I suppose, if I add a cockpit to the model, it should be a P-40 or P-51. . . . No, it'll be a Spitfire.